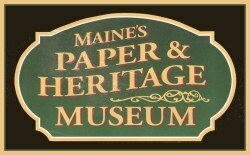 Sponsored by Maine’s Paper & Heritage Museum. Do you have a bad case of “cabin fever”? If so, a cure is planned for Saturday, March 24 when Murray Hall in Livermore Fallswill be filled with handcraft tables, paper projects, decorations and a kitchen overflowing with tasty lunch treats! The fair begins at 10 a.m. and finishes at 3 p.m. Proceeds will help add to a Heat Fund so that visits and programs can be expanded in the spring and fall with heated rooms. Decorations will feature yellow crêpe paper. Displays will include paper products such as post cards, wallpaper (Otis Mill once produced 80% of America ’s wallpaper), tissue flowers, origami objects, and old newspapers (newsprint was a major product from Otis). Present-day Verso papers will also be displayed. A variety of handcrafts and specialty items will fill rented tables. Admission is only $2 for each adult; free to children. Lunch treats from the kitchen will be priced. Expect music – live and recorded – and chairs around to visit old friends. At 2 p.m. a fun-filled silent auction will close and winning bids announced. For additional details, please call Sherry Judd at 897-3117.